Well, another week, where did it go? I cannot believe how fast the time is going, and I wish we could add another day to the week. I convinced my companion that we need to become more “consecrated” and give an extra effort to focus in only on the mission. One of the biggest distractions that we have had here in Ciudad Real is MUSIC! Everywhere we go, people are blasting their tunes, and a lot of times it is music in English… Believe me, I thought that here in Tazumal would be the last place in the world that I would listen to Ed Sheerans new music (though at this point I am not sure if it is new or not….) but, he found his way to El Salvador. So, we are trying to “set ourselves apart” a little more, and though hard at first, some miracles have happened….As a companionship we studied “A consecrated missionary” (this cool packet/talk thing) and we set goals on how we can better dedicate ourselves to the work. We both learned so much about the gifts that the Lord has given us, and our potential as missionaries, if we dedicate ourselves completely to the work. We are trying our hardest to be exactly obedient, and to give an extra effort when we feel tired or discouraged. And the Lord has poured out his blessings. We are starting to find more and more people to teach. As we are trying to find less active and inactive members, the Lord has guided us to some beautiful people that he has prepared to receive the Gospel message. The largest blessings we have seen this week have come from the Book of Mormon. We have been studying how to better present and teach from this wonderful book. We are trying our hardest to teach in every lesson with the Book of Mormon and to use it not only in lessons, but even in street contacting. On Saturday we went to visit a young man named Johnathan and he was so excited to see us. We had scarcely said hello when he asked if we had brought him his new “bible.” We did not have a lot of time to visit but we shared our testimonies of the Book of Mormon and gave him a copy to read. He held it as if it was made of gold and said that he would start to read it right away. When we invited him to be baptized he looked at us, then at the Book of Mormon, then said “Si.” Wow!!! 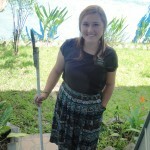 I love being a missionary!! We are reading the Book of Mormon as a mission as well, marking all the references to faith, repentance, baptism, the Holy Ghost and enduring to the end. I am also marking all the names of Christ. As we have been reading the spirit has become so much stronger in our lessons, our contacting, even in our home. Our conversation is focused more on the mission, we have achieved almost all of our weekly goals, and more than anything, we are so much happier. All my “mediatizing” scriptures are also from the Book of Mormon. This week is in 3 Nephi 12:6, gotta get the Spirit!!!! I love the Book of Mormon. As I have read my testimony of the atonement and repentance has grown so much. I feel the spirit as I teach, and I have come to have a stronger desire to help those I come in contact with. Another weekly highlight, we had Stake Conference!!! We had a special visit from President Spjut and an Area 70, Adrian Ochoa (he said a prayer in General Conference). He came to a multi-zone conference when I started my mission, and it was awesome to see him again over a year later. I shook his hand, and though we did not have time to talk, it was still a neat experience. 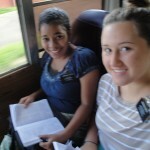 All of the talks were on the Sabbath day, scripture study and retention. There is so much work to do, and I left motivated to work another week in this great cause!! As for everything else, the weather is still hot, though we get an occasional rain at night, making sleeping so much more wonderful! The traveling circus has also come to town, and every night is filled with bright lights, scary clowns, and tons of fried foods (they even have something like funnel cake). It is a public menace, but a great chance to contact families! Thank you so much for all your prayers and support! I love you all and I am so grateful for everything! Keep the Faith, be happy, and be epic! 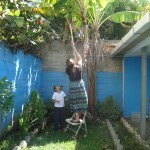 Pictures (harvesting plantains… it is a knife taped to PVC pipe…..) my companion wanted to cook, so we borrowed some plantains from the other sister missionaries.